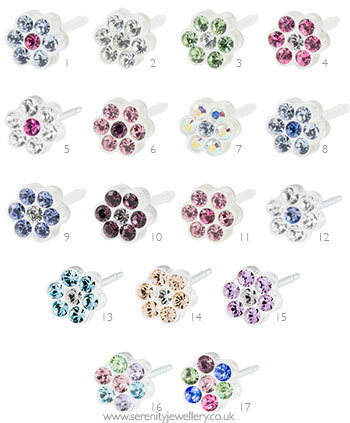 Hypoallergenic Blomdahl medical plastic daisy stud earrings. 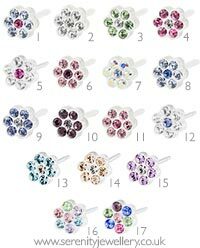 The 5mm flower is inset with seven Swarovski crystals. These earrings come with medical plastic butterfly backs. Also available as single earrings. Medical plastic is 100% nickel free. These earrings are made from a hardened version of the material used in surgical sutures and were created with metal allergy sufferers in mind. Please note that there is a thin, reflective metal foil behind the crystals in these earrings. It does not touch the skin when you are wearing or handling the earrings but do we advise that you check the suitability of these earrings before wearing them in a metal-free environment. Do not clean these earrings with alcohol (including surgical spirit), it will damage medical plastic. Soap and water is all you need. I bought these earrings because I have very sensitive ears and they work wonderfully, no pain and no infection. I was also impressed with how fast I got them. These earrings are very pretty and so kind to my daughters ears. Her ears wouldn't heal with her gold studs but once we used the plastic ones they've healed perfectly...no more bleeding no more tears! Very comfortable, attractive and speedy delivery. I'm so happy I finally found earings for my daughter that she absolutely loves! She's has allergys against metals so over the moon we found these! MY daughter has not been able to wear earrings due to constant infections. THESE SOLVED OUR PROBLEM AND SHE LOOKS BEAUTIFUL. Medical plastic is made from the material used in surgical sutures and is ideal if you don't want any metal touching your skin.